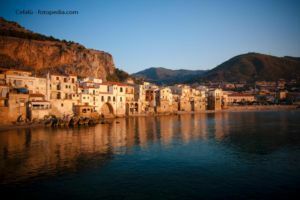 Picturesque and fascinating, Cefalù is one of the most famous destinations in Sicily: the town, located about 70 kilometers far from Palermo within the Park of Madonie mountains, is listed among the most beautiful hamlets in Italy for its historical, cultural and artistic value. Tourists love its large and golden sandy beach, as well as its charming center, with a marked medieval imprinting – narrow winding alleys of cobblestone leading to panoramic balconies overlooking rocky cliffs and the Tyrrhenian Sea, hiding plenty of stunning treasures, such as the public laundry, also known as “Medieval laundry”, that can be accessed through a lava-stone staircase under Martino Palace, as well as other beautiful palaces from the Renaissance such as Palazzo Piraino, the Bishops Palace and the Seminary. The most important and impressive monument, anyway, is the Cathedral: set right under the cliff dominating the whole town, this marvelous landmark was built in a higher area of Cefalù, which is why it can be spotted from far away while approaching the town. First built during the 12th Century, the Cathedral is an extraordinary example of Norman architecture – or, some say, “Sicilian Romanesque”: beautiful pointed arches and windows and two massive four-storey towers outside, and the breath-taking show of the byzantine-style mosaic of the Pantocrator inside, on the apse. The Cathedral is surrounded by a lovely square with palm trees: the perfect place for enjoying some delicious local gelato. Plenty of churches are noteworthy in Cefalù: from the ex church and monastery of Santa Caterina, now housing the town hall, to the medieval church of San Leonardo and the church of the SS. Trinità. But the best way to enjoy this fascinating destination is to walk through its winding streets studded with refined palaces (including the Mandralisca Museum, rich in beautiful paintings from the 15th Century including the world-famous “Ritratto di ignoto marinaio” by Antonello da Messina) and ancient boutiques, colorful food and wine shops with all the most tasteful local products, lovely bars and cafés overlooking the sea… And of course enjoying a dinner made of delicious local fresh fish in one of the typical restaurants of the town, many of which are equipped with wooden platforms upon the cliff: your meal will be served just a few meters from the sea, while you enjoy the infinite shades of sunset! The golden sandy beach of the town is perfect for families, but it gets very crowded during July and August, but no worries: gorgeous and less-crowded beaches are within easy reach – we highly recommend a day at Mazzaforno, Kalura or Sant’Ambrogio beaches, all set in the surrounding area and quite close to our exclusive villas in Cefalù. The finest white sand and a transparent sea: perfect for beach life lovers! And if you are looking for an estate really close to the best beaches of the island you should also check our beachfront villas in Sicily selection. If you are more into hiking rather than swimming, anyway, there is plenty to do for you as well: first of all, a visit to the Sanctuary of Gibilmanna, set on Pizzo Sant’Angelo, rising at 795 meters above sea level in the Park of Madonie Mountains. The place is a marvelous point of observation indeed, as it overlooks the whole area of Cefalù. Moreover, if you love trekking, the whole Park of Madonie Mountains will provide you with beautiful landscapes, interesting and peculiar traditions, flavoursome local delicacies and wonderful naturalistic itineraries.